Therefore we offer the suitable product for every application: For excellent print quality, efficient processes and the best handling. With personal advice, individual solutions and an innovative premium service. Against the backdrop of a steadily growing packaging industry, flexo printing has established itself in recent decades as a globally successful technique in relief printing. But there is also a great deal of competitive pressure. Complex print jobs, increasing quality demands and narrow time frames are forcing many printing companies to further optimize their production processes. To benefit from your decisive advantage, Lohmann, as a qualified partner, is at your side - from the first idea to process integration and beyond: Anytime and worldwide. This is what Smart Bonding for Flexo stands for - opimized processes covering the entire range of flexo printing. 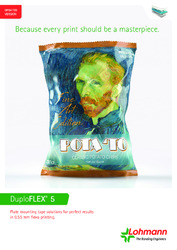 DuploFLEX® 5 for flexible packaging printing. The DuploFLEX® 5 meets the increased requirements in packaging printing: With a wide selection of adhesive tapes with different foam qualities, adhesive formulations and foam hardnesses, for exceptional results even at long and quick print runs. 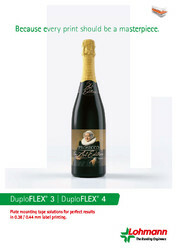 DuploFLEX® 3 and 4 for label printing. A frequent change of images, a large number of different types of content and information on the label, as well as complex designs - the label printing industry faces all these challenges. 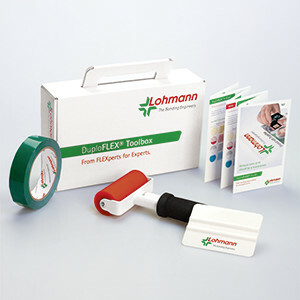 For printing labels, the Lohmann DuploFLEX® 3 and 4 ranges offer a wide selection of plate mounting tapes for the highest quality. 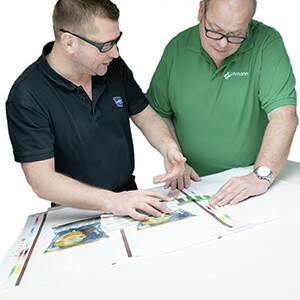 DuploFLEX® CB for high quality post print. The only way to move forward in high quality post print is to permanently optimize processes and quality. After all, packaging does so much more than just basically protecting. Whether you're looking for an eye-catching feature or a hands-on experience at the point of sale, DuploFLEX® CB is the right product to help you achieve your goals. First simulate, then integrate. Our innovative FlexoLAB shows the major steps on a realistic scale and our mission: Testing, analyzing and optimizing to achieve the best print results for you. Our aim is to map your process from A to Z, then simulate it in the FlexoLAB, so you can achieve the highest possible quality with the help of our customized solutions. The Lohmann FlexoLAB consists of a mounting machine and a print simulator. Want to know more? 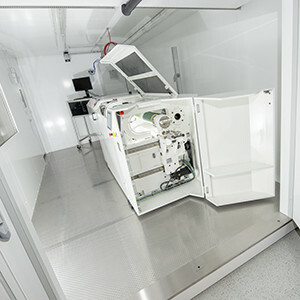 We analyze your process at our innovative FlexoLAB. Do you want your entire mounting process to be as efficient as possible? Our DuploFLEX® Toolbox offers everything you need. With practical tools for optimum mounting of print jobs. Roller/Squeegee: For bubble free mounting. Our technical know-how - your benefit. We, the Lohmann Bonding Engineers, are FLEXperts for the entire flexo printing process. Togehter we analyze your requirements, give the right recommendations and find the best solution for you. At any time, worldwide. One of the essentials for an efficient printing process is to know exactly how, where and under what conditions which plate mounting tape shall be used. This is where the experience and know-how of the Lohmann FLEXperts comes into play: We analyze your requirements in detail and find the right solutions with the right parameters. We support you anytime and worldwide regarding all questions you may have concerning your process. You can see more videos on our Youtube-Channel.